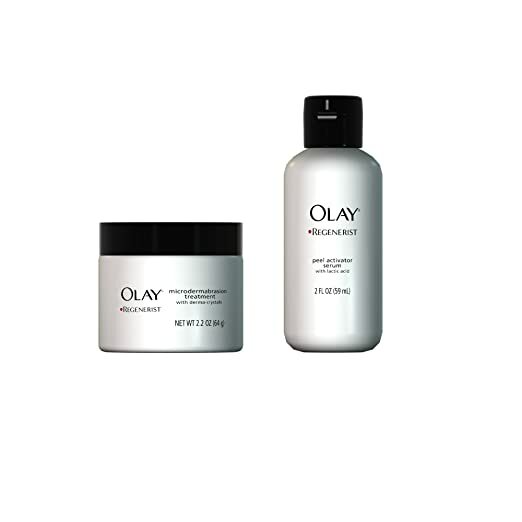 Olay Regenerist Microdermabrasion & Peel System is a two-step product. It contains a special formula to brighten up your skin tone and complexion through micro-peeling. If you aren't new to chemical peels, you should definitely check out Skin Obsession 25% TCA Chemical Peel. It's strong enough to give your skin a great transformation. Since it's strong, you should expect a stinging sensation and visible peeling at day 3 to 4. In case you are too hesitant to go for strong peeling agents, I suggest you try IQ Natural Pumpkin Peel Mask. It contains 12% glycolic acid and lots of antioxidants. If you can get past its clumpy texture, this is a nice product to have in your vanity area. Murad Intensive-C Radiance Peel is another product geared towards light peeling. Aside from its glycolic acid content, it also has vitamin C.
This means that it's great for acne and acne scars. It also works well in making your skin look radiant and glowing. Philosophy The Microdelivery Peel is another two-step peeling kit. I highly suggest this product to you if you're new to chemical peels. Although it's not as intense as the other products, it's easy to use and can leave your skin soft and supple. Olay is one of the most popular brands when it comes to addressing aging skin. Its at home chemical peel kit combines microdermabrasion treatment with a peel activator serum. This combination promises to help diminish your fine lines and wrinkles while encouraging cellular regeneration. This means you’ll get a softer and more radiant-looking skin as you use the product. Despite triggering peeling, the Olay Regenerist Microdermabrasion & Peel System has a gentle formulation. You can even use it twice a week. It’s infused with its own Instant Fix Formula to brighten up your skin tone. It also works to reduce the visible signs of skin aging. As for its texture, I like that it contains Derma-Crystals. Its mild coarse texture really gives you that buffing effect- without causing damage to your skin. The crystals are bicarbonate sodium crystals which are gentler that what most brands use. If you are looking for something with a stronger formulation, this may not be the best bet for you. Skin Obsession 25% TCA Chemical Peel relies on Trichloroacetic acid to help you get rid of your hyperpigmentation spots and wrinkles. It stimulates collagen to target scars and fine lines, too. Take note that this one is the strongest peeling product from Skin Obsession. If you are new to at home peeling treatments, I highly suggest you go with a lower concentration first, like the brand’s 15% Chemical Peel. People who have darker skin tones should skip this product as well as they are at risk of having pigmentation issues with this strength. A word of caution: The product does sting. Make sure that you thoroughly read the instructions to avoid adverse reactions. Peeling should begin at day 3 to 4. During this time, I warn you not to pick at your pimples or your flaking skin as it can cause damage or even discoloration once your skin starts to heal. 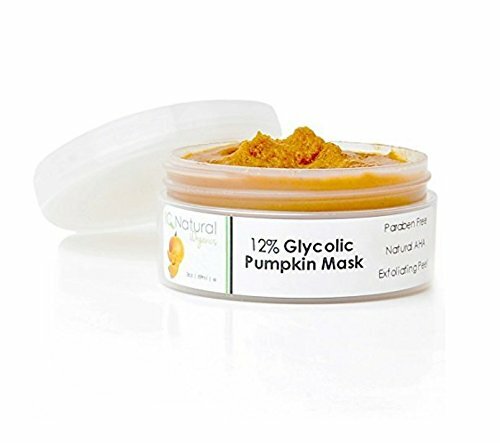 IQ Natural Pumpkin Peel Mask contains 12% glycolic acid. It also contains natural pumpkin which has very potent antioxidant benefits. This is a nice product to have particularly if you’re into spa-like experiences at the comfort of your home. To use the product, you only need to apply a thin layer and let it sit for five minutes before rinsing with a baking soda mix. As with chemical peels, you should expect a slight stinging sensation with this one. If you feel that the stinging is too strong or if you feel your face burning or in pain, wash it off right away. To stay on the safe side, I suggest you do a sensitivity patch test first. Even though the product only has 12% glycolic acid, it can still cause irritation particularly on extra sensitive skin. 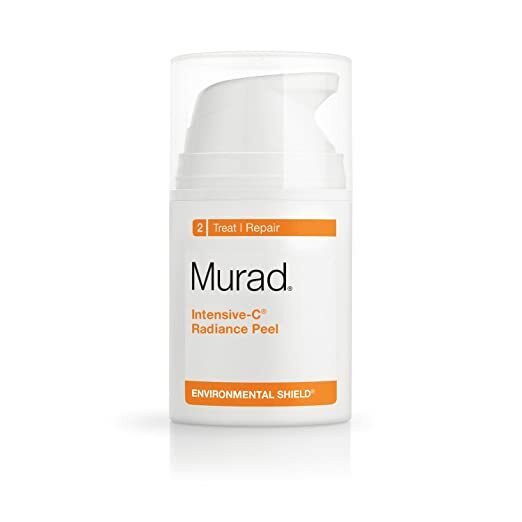 Murad Intensive-C Radiance Peel can improve your skin texture and radiance after just one use. It has glycolic acid to speed up your skin’s turnover rate. Aside from that, you also get vitamin C, Indian fig and myrtle extract. The combination of these ingredients can leave your skin radiant and protected against free radical damage. One intriguing thing about this peel is that it includes Kaolin in its list of ingredients. Because of this ingredient, you’ll notice the product drying up similar to a clay based mask. Take note that the product needs to be left on the skin for 10 minutes before rinsing. Another major deal breaker with this product is its fragrance. It also has menthyl lactate that can give you a cooling effect but can be highly irritating if you have sensitive skin. Despite these cons, the product works well as a peel product. If you’re skin isn’t that fragile, this is a good at home chemical peel to go for. 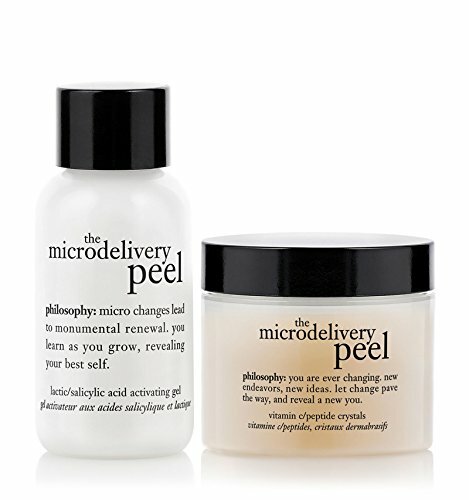 Philosophy The Microdelivery Peel is a two-item product. The kit has a salicylic acid activating gel and a Peptide resurfacing crystal. This two-step peeling product promises to reduce the size of your pores, minimize the appearance of your fine lines and reduce your wrinkles. It carries a scent you’ll find similar to an orange juice. Its consistency is like a microdermabrasion scrub. To use the product, you need to apply a layer of the vitamin C/ Peptide Crystal on your skin. Take note that you don’t necessarily have to rub the product or else you’ll get irritation. After leaving it for two minutes, you can add a very thin layer of the Lactic/Salicylic Acid activator. Mix the two components on your skin until they form a foam. Let it stay on your skin for another minute to allow the product to do its magic. DIY skin peels are great if you have problematic skin. They can help you get rid of wrinkles, hyperpigmentation spots and even acne scars. But, hey. Not all chemical peels are the same and it’s something you have to keep in mind when buying your product. Lactic acid is a great choice if you are new to skin peeling. It usually targets the superficial layer of the skin. It works well on almost all skin types. This type of chemical peel is fit for people who have oily skin. Similar to lactic acid, it also targets the top most layer of the skin. However, this one is a bit stronger. If you are having issues with blackheads and clogged pores, using a chemical peel with salicylic acid can be helpful. It’s oil soluble which means it can easily penetrate your pores to lift off deep seated impurities. Peels under this category are usually made from natural enzymes. This makes them safe enough to use on all skin types. Trichloroacetic acid peels provide deep peeling. If you are having issues with acne and scars, you can definitely benefit from them. Before you use a TCA peel, I suggest you start one with a low concentration first. Before actually trying out a chemical peel, make sure that you discontinue any skin treatments you are using, such as anti-acne products. I think skipping it 3 to 4 days is a good start if you are using glycolic acid and lactic acid peels. If you are going to use the stronger TCA peel, skip them at least 5 days before and 10 days after. It’s also a good idea to avoid soap-based cleansers a few days before the peel to prep your skin for the product. Since peels are generally acidic, using products that are alkaline can decrease their effectiveness. I can’t emphasize how extremely important it is to do a spot test before you actually apply a chemical peeling agent on your skin. Spot testing can give you a clearer idea of how your skin will react to the product as well as its tolerance. Spot testing needs you to mix the ingredients as how you would do for a full face treatment. Do not cut down on the portions just because you’ll only be applying on a small area. Let the product sit on your selected area for 24 hours. Keep it longer if you’re doing a TCA peel. If you encounter no itching, rashes or extreme burning sensation, you can proceed with the treatment. Using glycolic and lactic acid based peels may not result in extremely noticeable skin peeling. It’s a different story with TCA as it typically comes with flaking, peeling and skin redness. If you see your skin peeling off, do not- and I mean do not- pick at it. Pulling the skin can only result in more hyperpigmentation and scarring issues once your skin has healed. To relieve the discomfort, you can apply moisturizer and drink lots of water to keep your skin hydrated. You should also avoid direct sun exposure until your skin has fully healed. There are a lot of factors you need to consider when it comes to selecting the right chemical peel kit for home use. If you have lots of skin issues, such as acne scars, wrinkles and dark spots, we’re suggesting that you take a look at Skin Obsession 25% TCA Chemical Peel. The product is our best at-home chemical peel because of its strong TCA content. Because it’s strong, this chemical peel is able to get rid of skin impurities and clogged pores, too. In case you’re new to chemical peels, the brand has a lower 15% TCA Chemical Peel that you can use. Again, do a spot test first no matter which strength you choose.